Children are one of God’s greatest, purest gifts. When God told me it was time to conceive, I was pregnant within 3 months. What you don’t see in this featured photo of my 2 year old son, is that he battled for his life in the hospital when he was born 9 weeks early. Prior to his birth, I would lay my hands on my belly, and prayed fervently with passion for his life to be dedicated to Jesus. I pray my child will love you with all his heart, mind, body, and soul. I pray my child will be healthy in every area: Cardiovascular system, immune system, nervous system, etc. Sometimes God will allow the enemy in our lives to build strength. Jesus was tested by the devil for 40 days and 40 nights shortly after his baptism. I believe my prayers spiritually baptized my son while he was in the womb, and it was our turn to be tested. 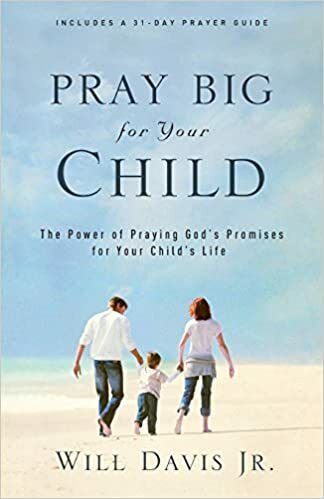 Behold this book called Pray Big for Your Child, containing several new strategies I hadn’t yet thought about. My prayers saturated my son’s entire being, and God displayed signs of that. Not long ago, my son fought a temperature for several nights. I removed my “worried mama” cap, and I laid hands on my sleeping baby. I placed my spiritual cap on, and quickly went into a healing prayer. Rustling in his sleep, he quietly murmured, “Abba.” I was astonished. I never taught my son about “Abba.” Up to that point, I have only taught him about Jesus. Have your prayers been bold and specific to the Lord lately? I challenge you, to allow yourself to be specific and expectant with prayers for your children. I am standing with you in prayer this minute, in hope we will create a new legacy for our children to be bold in Christ. In Jesus’ name, Amen.